Dreamforce, the annual Salesforce conference is the largest conference of its kind and brought 170,000 business leaders, marketers, salespersons, designers and developers to San Francisco. We were fortunate enough to attend this epic event for a project we branded and developed that was being presented at the conference. 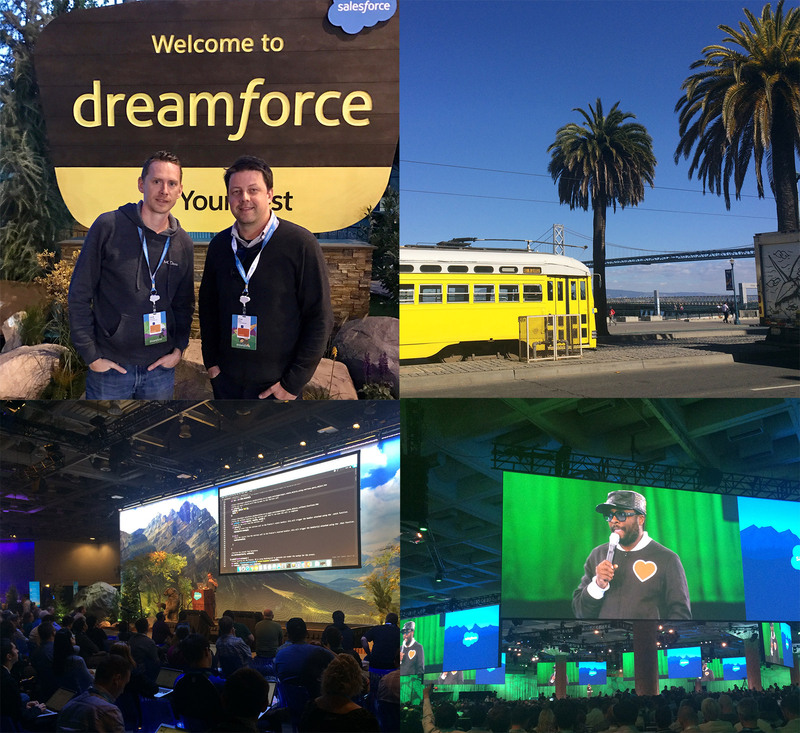 Here is a summary of our time at Dreamforce and some key takeaways. 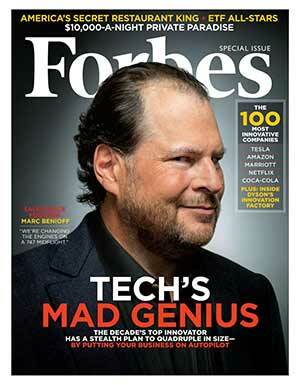 Salesforce CEO Marc Benioff is the mastermind behind it all. He is the larger than life personality that Forbes Magazine recently named “Innovator of the Decade”. However, the most notable characteristic of Mr. Benioff is his focus on giving back and equality. While Dreamforce is an amazing business conference showcasing significant advances in digital strategy, the biggest takeaway from the entire event was philanthropy. The event raised $1 million for (RED) from attendees to help end HIV/AIDS and the Benioffs matched that million dollars which was then double matched by Bill & Melinda Gates for a total of $4 million. In addition, Benioff donated $20 million to USC’s Children’s Hospital for their cancer center and they hired some little band from Ireland (U2!) to play Dreamforce which raised an additional $10 million for UCSF’s Benioff Children’s Hospital. The importance of giving back and investing in education was at the forefront of the entire event, at the keynote, and numerous philanthropy focused sessions. Salesforce has been a leader in doing things the right way with a strong focus on equality across gender, race and sexual orientation and have even recently hired a Chief Equality Officer. They understand that focusing on people (both employees and customers) is not just good for business but is simply the right thing to do. They have a 1-1-1 philosophy where they utilize 1% of Salesforce’s technology, people, and resources to create impact throughout the global community to improve the state of the world. In addition to the obvious reason we should all do more to give back, it’s extremely important for an organization and business to have a bigger purpose and guiding foundation that looks beyond their product and profits and focuses on enriching the lives of employees, customers and their community. If a company’s goal is simply to make the best product and a lot of money, they may do well but it will be harder without a team (or a legion in Salesforce’s case) that is excited, motivated, and fully committed to your mission. In addition, you won’t have the motivation to keep going in the long run. Once you’ve made your millions, what keeps you going? You won’t have that moral compass that makes decisions easier. That is how a little tech company that makes a CRM is able to grow into one of the most powerful and influential companies in the world. In addition to all of that giving is the project that brought us to Dreamforce – the Benioff Ocean Initiative. Marc and Lynne Benioff gifted more than $10 million to the University of California at Santa Barbara to create an innovative approach to saving our oceans. MODassic was honored to be hired to develop the brand identity for the organization as well as design and develop the website and idea submission platform. The Benioff Ocean Initiative takes an innovative approach by crowdsourcing ideas from everyday people around the world asking what problems they would like to see solved in their ocean. Each cycle they select a problem and then gather the best minds in ocean science and back it with a million dollars to solve that problem. Julie Packard and Douglas McCauley from the Benioff Ocean Initiative presented the project at Dreamforce as part of the Forbes Philanthropy Summit for a panel discussion entitled The Future of Our Oceans. You can watch the full session below. The idea of giving back was certainly the main takeaway of Dreamforce and helped inspire us to do even more; however, there were also some great business takeaways from the event too. At MODassic we talk about personas all the time. Persona based marketing drives every project we do. In addition, we’re big believers in using automation in marketing. Therefore, we were very pleased to see that Salesforce takes a similar customer focused approach in how they develop their platform and that the biggest product announcements centered around automation and AI. Salesforce launched Salesforce Einstein, an AI platform that brings machine learning and predictive analytics to the entire Salesforce platform. Einstein isn’t a separate product but rather a new layer across all of Salesforce. Within each Salesforce product, Einstein is now there utilizing your data to improve the experience, automation, optimization and make recommendations. Many people, especially those from an old-school sales model, may hesitate to accept new concepts like automation and AI. However, if they take a closer look, they will see how automation and AI actually allow you to get more personal and make a more relevant 1-to-1 human connection. It does this by automating the repetitive and mundane tasks and giving you more time for more important connections. AI analyzes data to surface insights and make recommended next steps. All of this gives you more time to focus on what is important and to make better decisions. Let’s say you are in sales and you have just 1 hour left in your work day. Automation handles numerous tasks for you so you’re free to focus that hour on calling your hottest prospects and AI prioritizes that call list with the top contacts you should call. AI can analyze your data and surfaces to the top the hottest leads so you can reach them while they are actively interested, allowing for more timely and relevant connections and experiences while automation can instantly set-up a series of activities to support that relationship. Automation and AI is not about replacing people but rather using data and technology to support people. Taking that concept further, when companies have their entire business (not just marketing or sales) fully integrated into a single system like Salesforce, they can now make connections in ways never before possible. For example, Fitbit is able to manage 1 billion customer interactions a year and while this is capable because of automation and AI it allows those interactions to be more timely, more relevant and more personal. One of the examples illustrated in the keynote is when a customer gets a new Fitbit. The marketing automation system immediately sends out a welcome email about adding friends and there is a series of if/then branches based on if they open that email and if they add friends or not. This is the kind of marketing automation we implement all the time for clients. However, they take this even further as the actual product is tied into the same system and automatically detects an issue with the battery life (even before the customer notices). The AI from Einstein analyzes product data and has determined based on existing data history that products with similar data will need to be replaced. Instead of waiting for this to happen, it automatically triggers a series of workflows across departments to address the issue. The user gets a notification it’s being replaced at no charge and is on its way. In addition, it schedules a call reminder for their customer service rep to follow up with the customer to see if they have any questions. At the same time the automation kicks off the logistics workflow to ship the replacement package. This is only possible because everything (including product data, marketing, customer services and shipping) is integrated into Salesforce. Traditionally, a customer would have to wait until they notice the battery issue and contact support. Support would have to spend time diagnosing the issue and determine if they should replace it or not. They would then have to file this report with the warranty department who would then have to pull the replacement product and ship it out. That takes a lot more time, a lot more company resources and even if the product was replaced for free the customer wouldn’t be as happy. Now the problem is taken care of before the customer even knew there was an issue and the Fitbit employees were notified with the next best steps to take. In what ways could your business benefit from automation and AI? We implement strategies like this across marketing and sales for clients every day. We help marketing teams automatically nurture top of the funnel leads and utilize lead scoring AI to trigger workflows and notify sales when a lead is ready to be contacted. This drastically improves the efficiency and effectiveness of a company and improves the customer experience and ROI. In what ways can your company do more to give back? At MODassic, each year we hold our Createathon event where we pull a 24-hr pro bono all-nighter for charity. We’re gearing up for our 2016 event and you can watch a video of our 2015 Createathon and our 2014 Createathon. In addition, Dreamforce has inspired us to look for even more ways we can all do more individually and as a company.